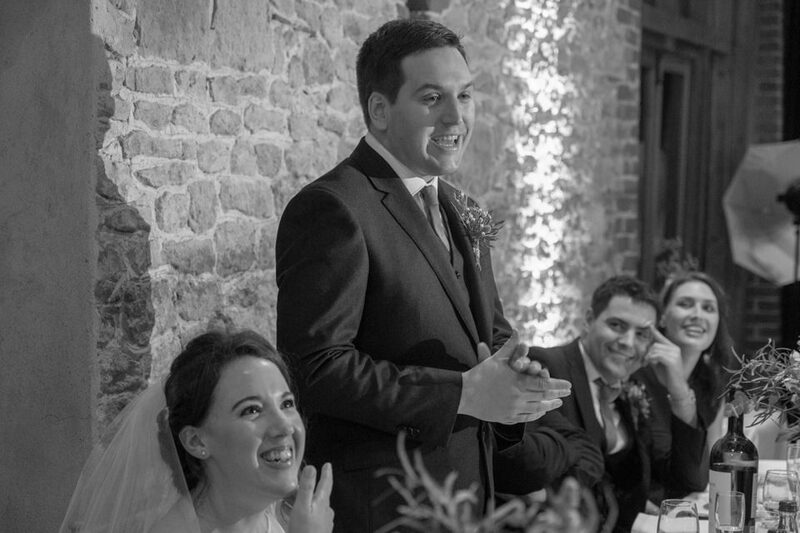 There is a particular charm about autumn and winter weddings. 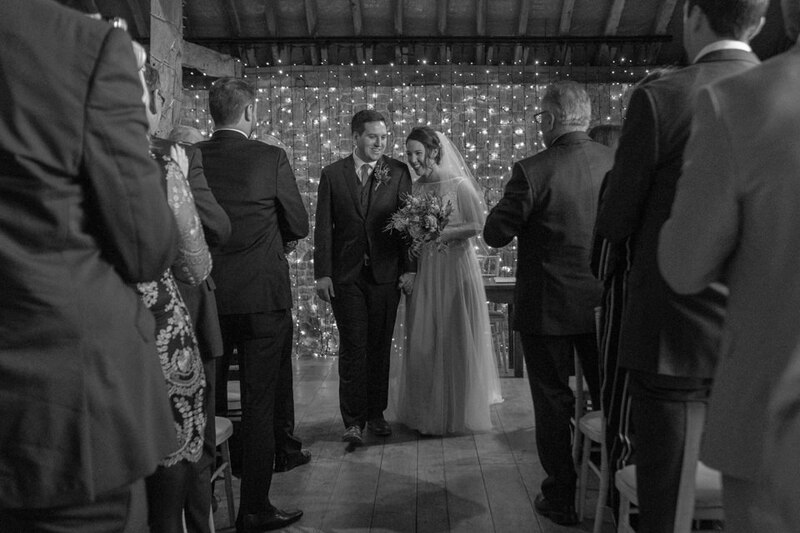 As the temperature drops, the overall atmosphere seems to exude more warmth and cosiness. 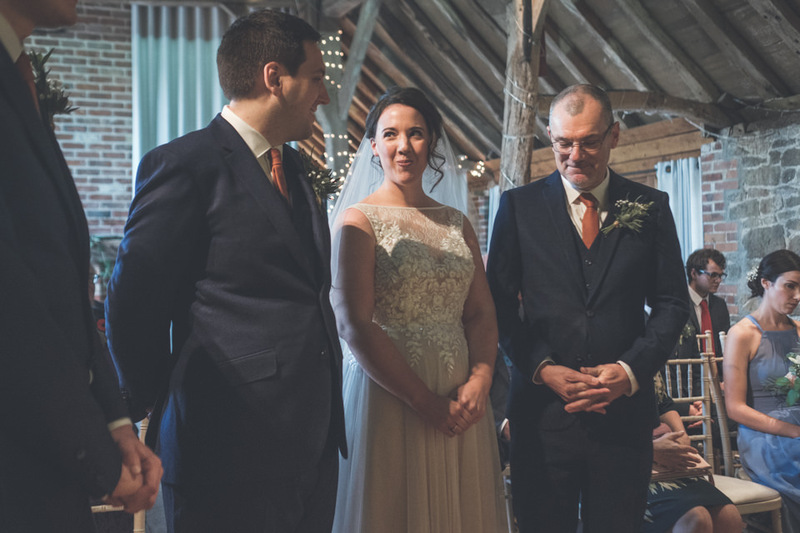 A lovely start to the winter wedding season was the Sussex wedding of Charlotte and Nick who got married at the beautiful Grittenham Barn. 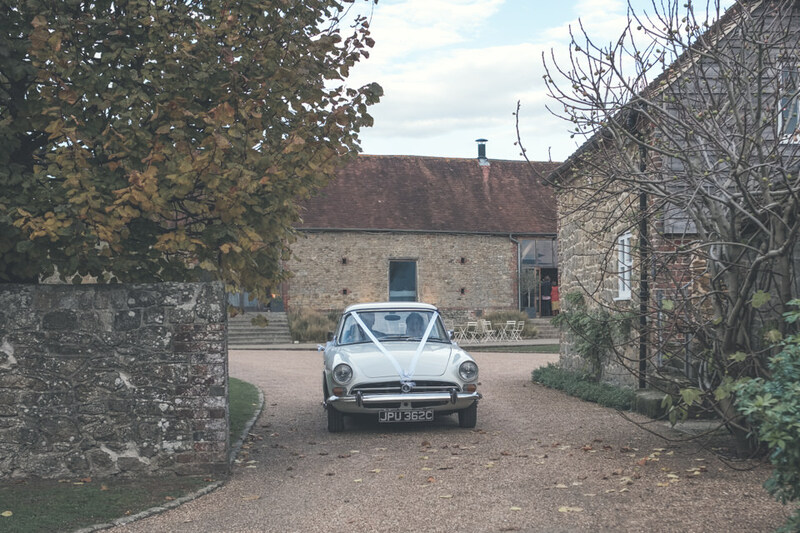 The restored traditional stone barn at the heart of West Sussex is ideal for weddings throughout the year, but on this November day it really did feel like the perfect wedding venue for Nick and Charlotte’s special day. 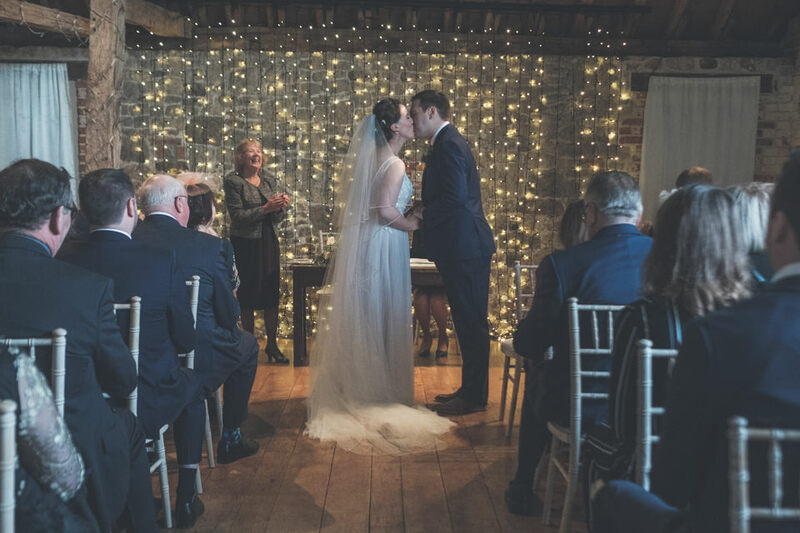 The gorgeous Grittenham Barn has both rustic allure and traditional country elegance, as it is surrounded by picturesque gardens, an orchard and woodlands. 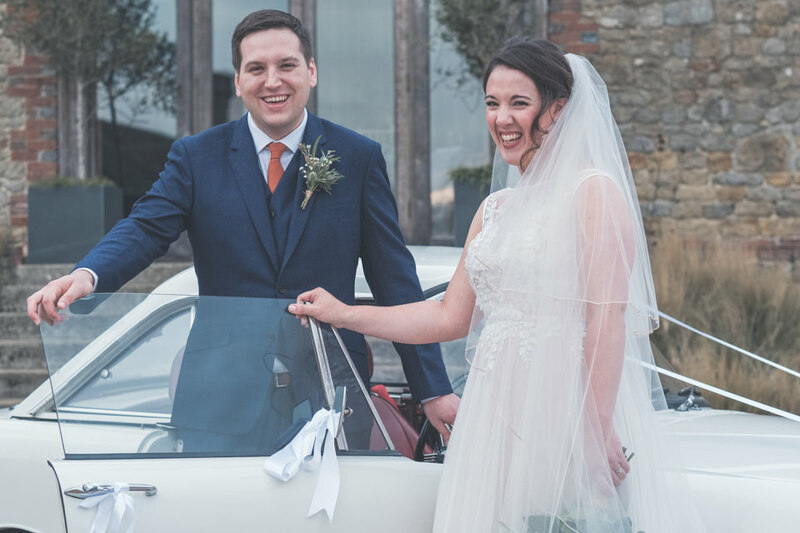 Charlotte arrived in a quaint sports car which added to the timeless feel. 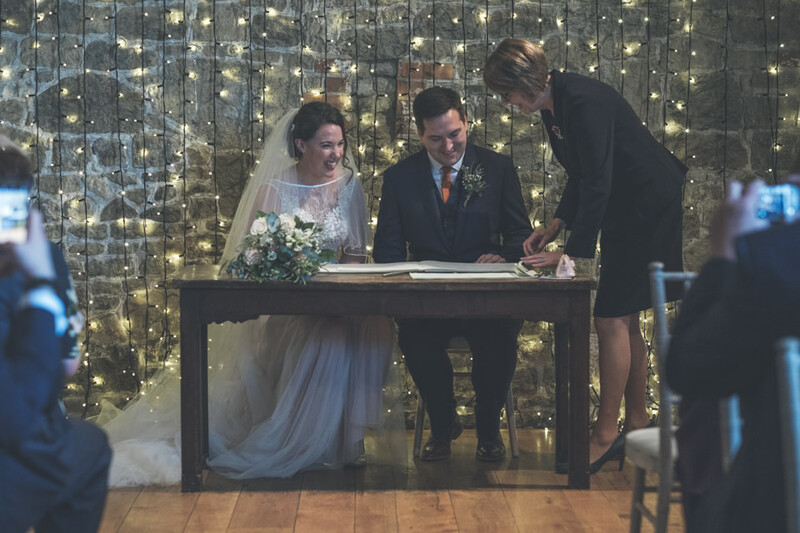 The decorations were kept to a minimum embracing the rustic setting - the main accent was the beautiful fairy light curtain in front of the rugged stone wall, creating a truly magical backdrop for the ceremony. 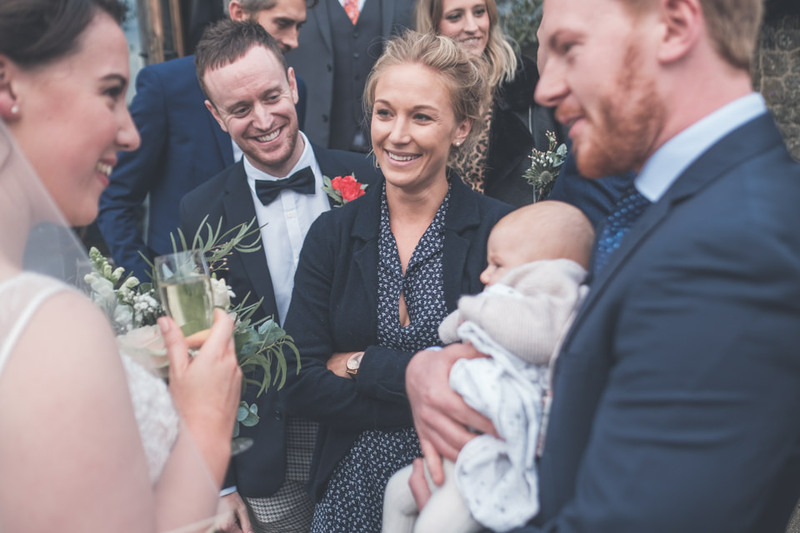 The bride carried a boho-inspired bouquet with white roses and eucalyptus leaves. 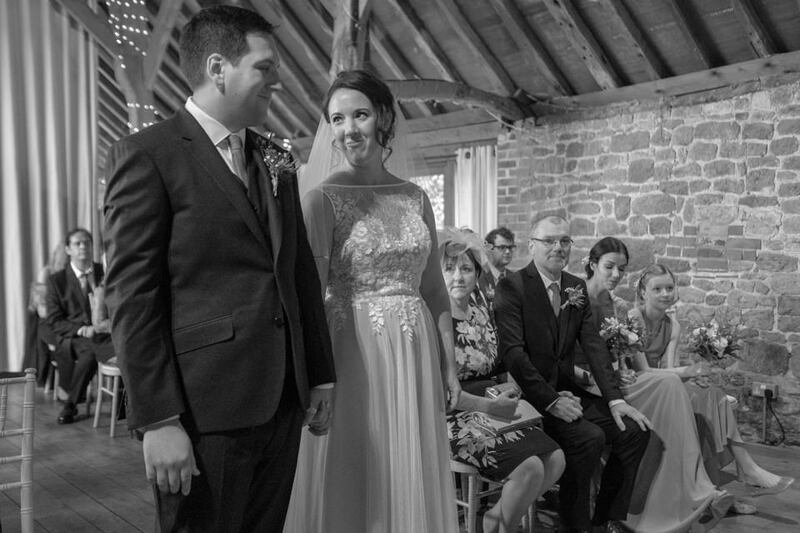 The warm and inviting space was a great fit for this intimate wedding. 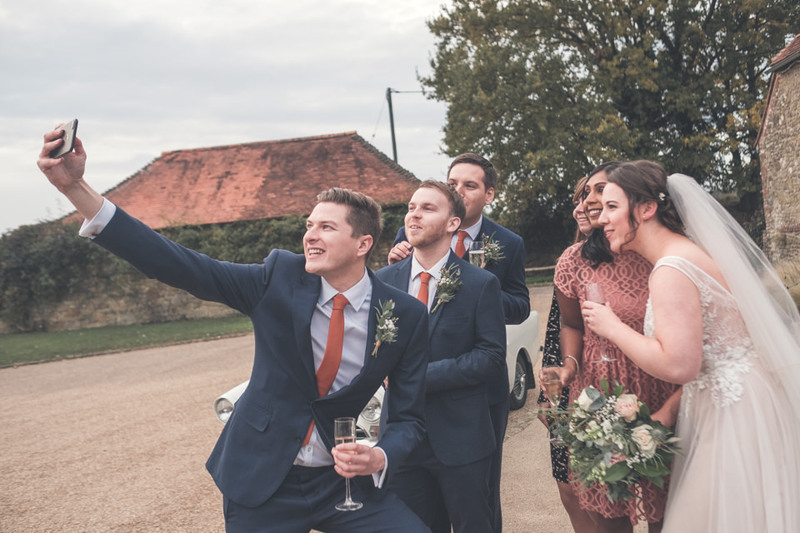 After the ceremony, family and friends greeted the newlyweds with a romantic rose petal send-off. 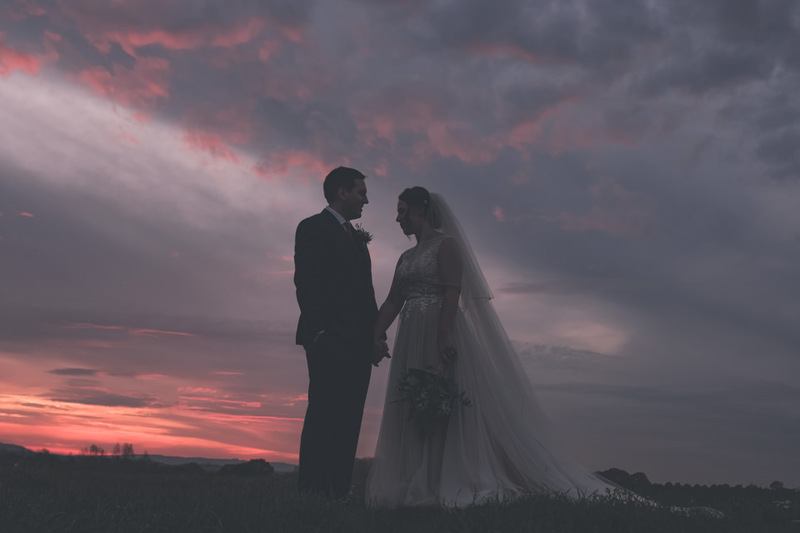 Grittenham Barn has an abundance of charming wedding photography backdrops that look so lovely in late autumn and winter - the coloured leaves in shades of red and orange compliment the stone building, and on this occassion, the vastness of the surrounding landscape truly came to life during the dramatic sunset which created an unforgettable moment and wonderful photographs for Charlotte and Nick. 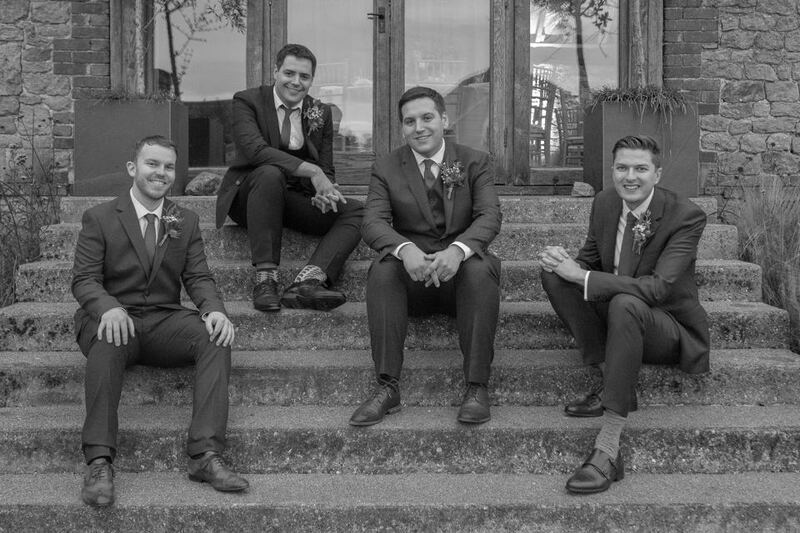 The wedding reception was sweet and heartfelt. 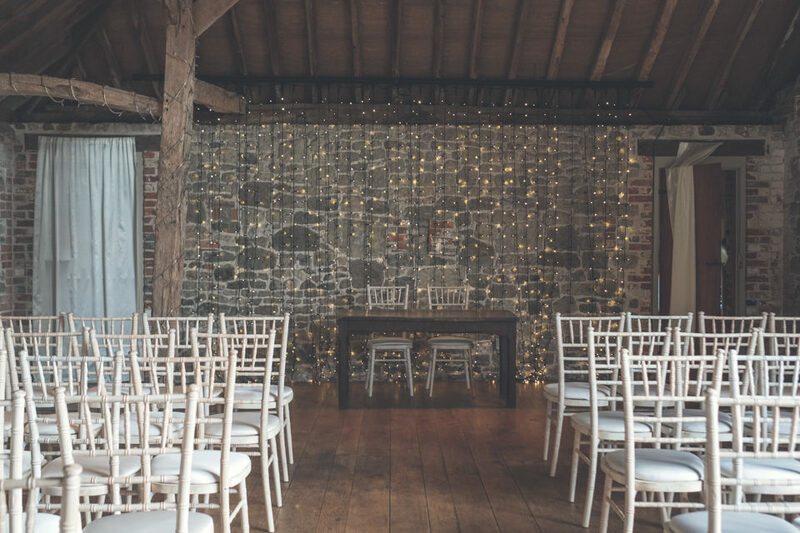 Just like the wedding itself, the wedding breakfast setup was kept in-line with the barn wedding theme featuring beautiful fairy lights and lush green florals everywhere. 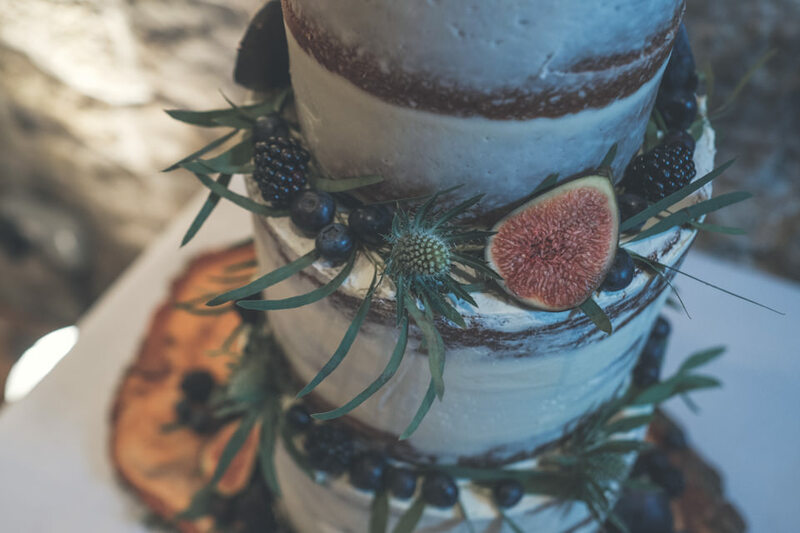 As Charlotte is a baker, she made the wedding cake herself - a real masterpiece, the three-tier cake was decorated with fresh berries and figs. 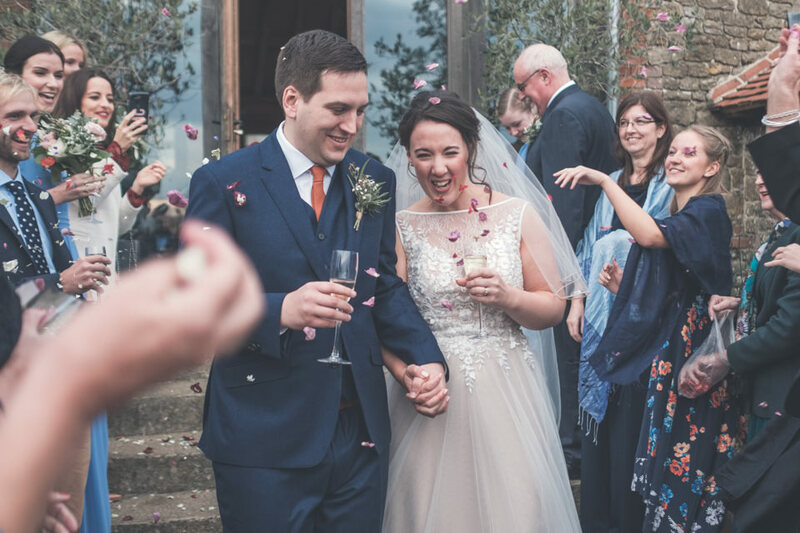 Charlotte and Nick were married on the 5th November, Guy Fawkes, and their friends and family created a beautiful tunnel of sparklers - such a fun addition to the wedding and perfect on Bonfire Night!